ATN NVGONVG7C0 NVG7-CGT Night Vision Goggles FREE SHIPPING! 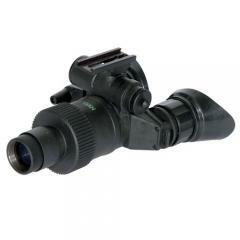 The ATN NVG7-CGT Night Vision Goggles provide high-grade nighttime visibility in a platform similar to the US Military's PVS-7. Its compact, pseudo-binocular design and precise digital controls are exceptionally user-friendly for instant use with little training. The goggles come with quick-deploying, flip-up headgear for hands-free use. Alternatively, it can also be mounted on a helmet allowing it to slot into any tactical loadout. Its multi-coated, all-glass optics provide excellent light transmission and clarity. The scope itself can be upgraded with optional 3x, 5x or 8x lenses for longer-range observation. In total darkness, the wide-angle infrared illuminator takes over to provide reliable close-up illumination, allowing observation and tracking of targets in any field condition. ©2002-2019 CopsPlus.com: ATN NVGONVG7C0 NVG7-CGT Night Vision Goggles FREE SHIPPING!